Are you planning a painting project with a paint sprayer at home? Before you start, you will need a primer. A good primer covers existing paints, stains, and odors. It will ensure that your paint looks smooth and stick better to the surface. There are 3 basic types of primer: oil-based, latex and pigmented shellac primer. In this article, we will focus on the oil-based primer and give the best and latest primers so you can choose the most suitable one. When Should You Choose an Oil-Based Primer? Porous materials (concrete, wood, drywall, and even certain metals) will make painted surfaces have a bad texture when the paint dries, and make stains uncovered entirely. The oil-based primer will help you with these difficulties. Oil-based primers help the paint stick properly to the surface. It creates a consistent coat that becomes smooth as it dries. A good oil-based primer will cover up stains and prevent an old stain from leaking through to the paint. It can also protect woods that tend to have their tannins bleed through over time. To cover surfaces that are beginning to get old, a primer is your best choice. It will help to cover any cracking or chalking to offer a new look. Oil-based primers can also be tinted at the paint store if you will be using very light or dark colors. Zinsser 03504 weighs 2.7 pounds with dimension 4.2 x 4.2 x 5 inches. This oil primer and sealer is best in covering stains. They disappear after you just sprayed it on. The formula does an excellent job of dealing with old cigarette smoke and odors. We found the primer to be easy to sand and it dries quickly. It works well for both interiors and exteriors. On the interior surface, the primer dries quickly. On exteriors, it helps deliver full penetration and flexibility on surfaces. With high-hiding formula, Zinsser blocks and prevents all kinds of stains. KILZ Original weighs 2.8 pounds with dimension 13.3 x 9 x 5.3 inches. This product is amongst the top 3 popular primers at Lowe’s stores. 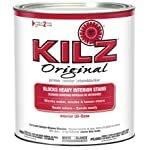 KILZ has been making premium primers which makes the paint stick better to surfaces and can cover existing stains and odors while preventing new stains and odors. This product supports only the interior surface including wood, drywall, plaster, paneling, wallpaper, masonry, brick, painted metal, and properly prepared glossy surfaces. True Value HP208-QT weigh 3.1 pounds with dimension 3.1 x 3.9 x 3.1 inches. This ultra-premium primer is an acrylic latex formula, though is still an oil-based primer. That means you get the benefits of all three types within one single product. True Value supports only interior surfaces but is excellent for basement floors. With 100% acrylic latex formula, it will be fast and easy to clean up. If you’re looking for an all-weather product, this primer gives you the best results that you want. It can be used under latex or oil-based paints. It applies nicely through a paint sprayer and offers topcoat consistency with very little effort. True Value is also offered a lifetime warranty, providing you the best services. This product supports both the interior and the exterior surface. With 100% acrylic interior and exterior primer formula, it can seal and suppress most bleeding type stains. It can be used on new or previously painted concrete, drywall, wood, masonry, gloss or difficult surfaces, and metal. The oil-based formula seals uniformly and provides a smooth, white finish. 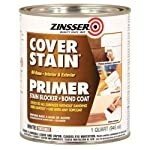 Furthermore, it has excellent stain blocking properties and can be used over any oil or latex topcoat, which makes this primer great for latex paint over an oil-based primer. Benjamin Moore Fresh Start combines many of the qualities desired in a primer: high hiding, excellent adhesion (even over chalky surfaces); blister resistance, quick dry, spatter-proof and minimal odor with excellent flow and leveling. It has been further designed to block stains with only one coat and will stick to any surface without the need for sanding. Fresh Start covers an area of 12 square feet and dries to the touch in just 30 minutes. 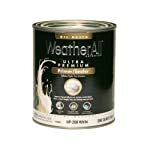 A stain killing primer/sealer all-in-one finish that comes with a vertical aerosol for home projects with gun sprayers. ProBlock is sold exclusively at Sherwin-Williams stores. This product supports only interior surfaces including drywall, wood surfaces, cured plaster, ceiling tiles, paneling, nonporous wallcovering, and previously painted surfaces. You will not have to sand the surfaces before applying this primer. ProBlock dries to touch within 30 minutes and dries to recoat within 60 – 90 minute. It ensures a smooth finish. This primer seals out water sensitive stains, dried water stains, smoke stains and related odors, grease, ink, and pencil stains. You can use ProBlock to hide dark stains and prevent tannin bleed, while at the same time providing deep penetration to ensure an amazing seal to wood surfaces, making this product a great oil-based primer​. Oil-Based vs. Latex Paints: What’re the Differences? When your surface is covered in the primer, the next step is to apply the paint. But you don’t know if an oil-based or latex paint can work well with the surface. How are they different? The main difference between oil-based and water-based paints is the type of solvent used in the paint. It is the liquid component of the paint that evaporates as the paint dries. Oil-based paints use an organic solvent, which is typically mineral turpentine. For water-based, or often referred to as latex paints, the solvent is almost all water. An organic solvent is made up of petrochemicals and plants and expels the fumes into the atmosphere as it evaporates. This fume has a strong odor, is flammable and can have a harmful effect on the environment and human health. As water-based paints feature solvents that are primarily made up of water, they release much fewer VOCs into the air and are therefore considered better for the environment and people’s health. Oil-based paints can achieve a higher sheen level, makes your finish paint looks smooth, but it becomes dull easily over time. Water-based paints achieve a lower sheen finish, but water-based paints can typically maintain this sheen level over a longer period. Excellent resistance to wear and tear Effective when resisting damage and wear and tear. More likely to crack, become dry, brittle and chalky over time Be able to expand and contract with weather conditions, making them less susceptible to cracking. Water-based paints perform brilliantly on exterior applications than oil-based paints. Water-based paints are much more resistant to UV rays, allowing them to retain sheen levels and colors for a long time. The flexibility in the paint makeup means the paint can move with the substrate as is expands and contracts in different weather conditions. While with oil-based paints, the paint will break down in UV light and develops a chalky surface. Oil-based paints have little to no flexibility. The paint is not able to expand and contract with the substrate in differing weather conditions, making cracking more probable. Water-based paints can tolerate small amounts of moisture on a surface prior to application. Oil-based paints repel water. The paint is unable to create a strong adhesion bond to the surface. As a result, any substrate that oil-based paint is applied to must be completely dry before application. Your purpose of using the paints can lead to various drying time. Water-based paints are much easier to clean up due to the solvent being mainly water, and brushes and painting accessories can by typically cleaned with water. Oil-based paints require turps or other specialty thinners to be used in the clean-up process. Can You Use an Oil-Based Primer with Oil-Based or Latex Paints? With this method, we can create a strong, lasting surface. The process includes preparing the surface and applying the primer. Oil-based primers take at least eight hours to dry. Before you start painting, you may have to lightly sand the primer over smooth wood surfaces with 180-grit sandpaper to provide an easier bonding surface. Make sure you wash away any dust caused by the sanding. Wait for the area to dry before adding your paint. As a general rule, you should apply two even layers of latex paint over the primer after it is dried. Allow between two and four hours for each layer to dry. A room will take approximately 16 hours of drying time between the primer and two layers of latex. This does not include the drying time after cleaning, nor the time required for the painting process. While oil-based primers can be mixed with oil-based paints, they can be used to fix old surfaces that have had oil-based paints. An oil-based primer is recommended to be applied over an oil-based top coat; then a water-based paint may be used as a top coat. This method eliminates the problem of existing oil-based paints, especially on trim, from rejecting water-based paints. This stops the peeling and blistering problem. Even if you don’t know the type of paint that is already existing on the surface, always use an oil-based primer to eliminate any future problems. Oil-based primers are also very good remedies for covering staining on walls and ceilings that have oil-based paints. When there is an old, non-recurring, stain on a wall, ceiling or trim, then the use of an oil based primer to hide the stain is recommended. Once it dries, a water-based topcoat may be applied. Is Oil-Based Primer Good for Exteriors? Most paint sprayer projects at home include furniture or wood surfaces. Oil-based primers are best when you use for exteriors. With the slow dry feature, oil-based primers can penetrate deeper into the wood. This offers a better undercoat. If you have knots in the wood; this will also prevent future show through. And if you are painting wood that is prone to bleed through, oil-based primers are always the best option. Most exterior surfaces tend to be textured or rough. If combining oil-based primer with latex paints, this will help you to resist the staining and weathered look that often happens with exterior surfaces. Paint sprayers mostly use oil-based without thinning. Run the undiluted primer through your sprayer to evaluate its thickness. It will provide you with a thin mist. The paint sprayer makes the painting job easier than ever. But oil-based primers can be difficult to clean off the sprayer. To maintain a good status for the sprayer for a long time, you will need a cleaning schedule. Below are some instructions for cleaning your paint sprayer after using oil-based primers. Clean off the outside surfaces of the suction and drain hoses. Clean the prime circuit, the hose and spray gun using paint thinner. Capture any primer exiting the drain hose and the spray gun. Return it to the unused paint container. Flush the drain hose and gun hose for 2-3 minutes. Store the sprayer with mineral spirits in the pump, hose, and gun after your painting project. Store the sprayer with paint thinner in the pump, hose, and gun. Priming is a key part of making your painting project more successful. And with oil-based primer, using your paint sprayers at home is not something difficult anymore. The paint will now stick properly to the surface, becomes smooth as it dries, covers up stains and prevents an old stain from leaking through to the paint, protects woods that tend to have their tannins bleed through over time, and so on. With oil-based primers, your house will have a long-lasting and beautiful paint.